Greetings all and welcome to a special Halloween edition of leggy cooks. As I’m sure you can see from the photo, my kitchen was infiltrated by the long claws of scary bear this morning. 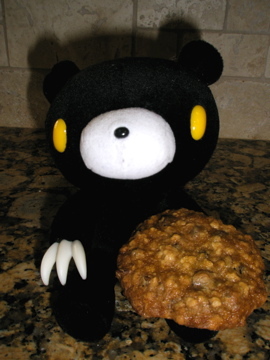 He was climbing into the cupboards pulling out all kinds of ingredients and he would not leave until I baked his favorite sweets; aptly named monster cookies. This of course was not too difficult of a request to satisfy since in the last two weeks I have baked no fewer than 5 types of cookies and one pie, but needless to say I never expected a monster to be my primary impetus for culinary creation. Luckily scary bear has excellent taste. 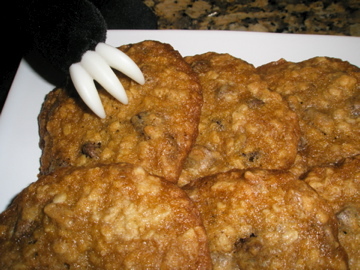 Monster cookies are suitable for monster and human consumption and are absolutely scrumptious. They have a crisp exterior that yields to a chewy middle and they’re filled with a ton of delicious morsels including peanut butter, chocolate chip, semisweet, and toasted pecans. So hurry and make this today before a monster comes after you and have a Happy Halloween! In a large bowl cream together the butter, yogurt, and sugar. Next add in the vanilla and egg and stir just to combine ~15 strokes. pour in the flour and leavening ingredients and gently mix. Once only a few faint traces of flour remain in the batter add in the oats. Once the oats have been evenly incorporated into the batter add in the nuts and chips. Drop batter by rounded tablespoons onto a baking sheet and make sure to leave about a 1.5 inch space between batter drops as these cookies spread. Bake 10-12 minuets until edges are golden brown. Serve with a tall glass of milk to your favorite, ghost or goblin. Previous: Previous post: Tomatillo-Pepita Gazpacho!